Special combo w/BBQ roasted pork, shrimps, crab stick & quail's eggs. 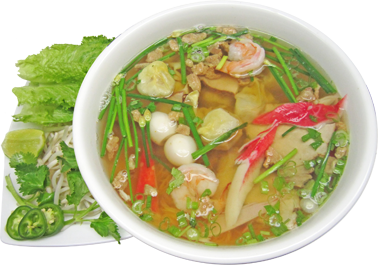 Rice noodle soup w/shrimp, squid, scallops, crab stick & quail's eggs. Special combo w/wonton, BBQ roasted pork, shrimps, crab sticks & quail's eggs. 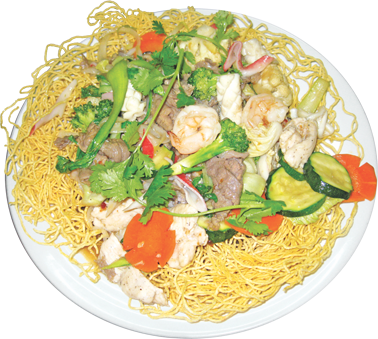 Special combo egg noodle soup w/wontons, BBQ roasted pork, shrimp, imitation crab, quail's eggs & vegetables (carrots, brocolli, cauliflower, mushrooms, zucchini, napa & baby bokchoy) . Bean thread noodle soup w/chicken, carrots, black-ear mushroom & mushrooms. Spicy combo jumbo vermicelli soup w/ rare beef, brisket, flank, tendon, shank & beef/ pork cold-cut. Served w/ side of cabbage, basil & cilantro. Your choice of only rare beef for the same price. 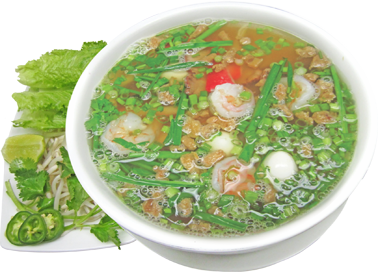 Spicy combo jumbo vermicelli soup w/ shrimp,scallops, squid & imiation crab. Served w/ side of cabbage, basil & cilantro.